Who better than an artist to show you how to change perspectives. Dale Chihuly, world renowned glass sculpturer, challenges preconceived notions of space, weight, elements, colors and perspectives. Creating glass sculpture sea gardens filled with whimsey, imagination and transparent lightness, Chihuly draws you in as though you were a light fish floating through the colorful sea plants. Chiluly turns you inside out. Lay on the ground. Look at the sky. Float among the sea plants or be startled by frozen neon in glass. His glass becomes alive, vibrant, warm. Chihuly’s creations weave this spell as though Scheherazade is whispering a tale to entice the unsuspected in, for just a moment, until the spell is broken, the glass shatters and is dusted away forever. 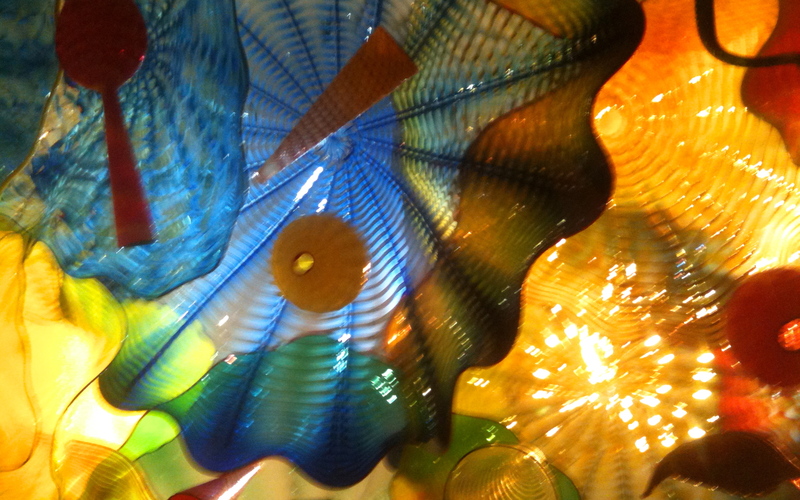 Chihuly charms the spirit and yet the memory lasts forever. Chihuly is on exhibit at the Virginia Museum of Fine Arts for six more days, closing on Feb. 10, 2013. Enjoy the day at the museum. Have lunch at the cafe; have the champaign cocktail Kaleidoscope in honor of Chihuly at AMuse or dinner later at the Athens Tavern, an authentic Greek restaurant in the Fan District. It is well worth the visit and an experience you will always cherish. Tags: color, Dale Chihuly, Fan District, glass sculpture, Greece, Greek, Persian Ceiling, Richmond, Richmond Tourism, Seattle, Virginia Museum of Fine Arts. Bookmark the permalink.